Provide comfort for the family of Kenneth Lauderbaugh with a meaningful gesture of sympathy. Mr. Kenneth Darrell "Kenny" Lauderbaugh, age 92, of Vevay, Indiana, entered this life on August 12, 1926, in Madison, Indiana, the loving son of the late, Avon and Lelia (Romans) Lauderbaugh. He was raised in Madison, Indiana, where he attended high school. 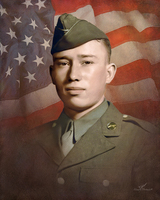 Kenny was inducted into the United States Army, serving during World War II. He was honorably discharged with the rank of Technician Fifth Grade and served in Company A 803rd Engineer Aviation Battalion on November 24, 1946, at Fort Sheridan, Illinois. Kenny had been a mechanic for over 30 years and owned and operated Lauderbaugh Service on the corner of Walnut and Main Street in Vevay, Indiana, for 18 years. Kenny resided in the Switzerland County community since 1959 and was a member of the Cornerstone Baptist Church in Hanover, Indiana. Kenny passed away at 12:20 a.m., Saturday, January 12, 2019, at the Swiss Villa Nursing & Rehabilitation Center in Vevay, Indiana. Kenny is survived by his sister, Frances Thurnall of Clarksville, IN; his nephew who cared for him, Pastor Leon Turner of Hanover, IN and other several nieces and nephews. Funeral services will be conducted Tuesday, January 15, 2019, at 11:00 a.m., by Leon Turner at the Haskell & Morrison Funeral Home, 208 Ferry Street Vevay, Indiana 47043. Interment and full military rites will be conducted by the Honor Guard of the Vevay American Legion Post #185 and the Vevay VFW Post #5396 in the Vevay Cemetery, Vevay, Indiana. Friends may call 10:00 a.m. - 11:00 a.m., Tuesday, January 15, 2019, at the Haskell & Morrison Funeral Home, 208 Ferry Street Vevay, Indiana 47043. To send flowers in memory of Kenneth Darrell "Kenny" Lauderbaugh, please visit our Heartfelt Sympathies Store. Donations are being accepted for: Vevay American Legion Post #185. Provide comfort for the family of Kenneth Darrell "Kenny" Lauderbaugh by sending flowers.